In this job I see some pretty spectacular things, hear astonishing sounds and, on tour at least eat some incredible food (I had goat last night but passed on the bullfrog). I am surrounded by some fabulous musicians and hear the greatest soloists in the world as they pass through on their constant world tours. As you can imagine though it takes someone or something quite special to stop the clocks and do something truly breathtaking that makes the orchestra stop and stare in astonishment. The first concert at Expo was one of those moments. The Expo site is a strange sight indeed. It looks like the evil plan hatched by a renegade civic planner who has watched one too many alien invasion B movies and then been given an unlimited budget and a blank canvas. I mean that as a compliment.. When the town planners get together in a British town like…London lets say, and someone wants to build a new house in an already developed neighbourhood, they have to make sure it fits in with its surroundings, has the required green credentials and possibly is in the same kind of rough style as the nearby buildings. Then it gets built and everybody will say how fabulous it is that the cornices have echoes of the early Wren architecture of the church down the road and yet retains its modernistic texture of polished concrete which in the right light looks like Portland stone, but more, like, modern. It fits in but still looks individual and everyone is happy, except Prince Charles, probably. That hasn’t happened at Expo. Oh no. I would guess that all the different countries kept their designs secret until the last minute and then a frantic building frenzy ensued. When the dust finally settled they were greeted by the site of the Cultural centre which looks like a flying saucer, the British seed cathedral, which is brilliant, and looks like a giant hairy sweet and the Japanese building which is a big pink inflatable that looks like a Pokemon. None of it fits with anything else and so consequently it is all rather fabulous and much like landing on an alien planet. From what a lot of my friends tell me though, although the inspiring architecture was sensational, the favourite country with the orchestra on the hot day before was the Belgian pavilion with its chips, mayonnaise and beer. Nobody could remember what the building looked like. Anyway, in case you were wondering, great as it is, the Expo itself wasn’t what I was referring to just now. The hall had been built specially for the expo, so nobody had any idea of what to expect inside. There are moments, like when you walk into the Musikverein for the first time, that the beauty of the hall makes you smile, the sound even more so. Well when I walked in there was a small group of musicians simply standing and staring. I couldn’t really see as it was quite dark, but I think I could describe the interior of the hall as functional. It soon became apparent that it wasn’t the hall that was causing the crowd. Just as the spotlights were finally turned on, the crowd parted and I was greeted with a sight which was truly breathtaking and certainly stopped me in my tracks. Jean-Yves Thibaudet, the piano soloist who often wears quite flamboyant stage clothes was sitting at the piano for the hall contemplating, I imagine, for the first time in his life being upstaged by his instrument. 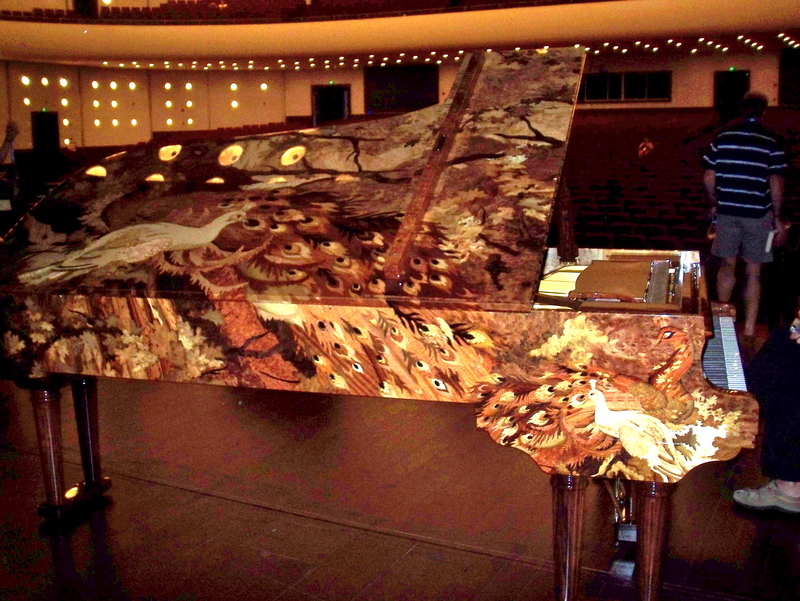 With words I cannot do the piano justice, but in answer to your question, yes it is laquered woodwork and yes they are peacocks. This entry was posted in China September 2010, Gareth Davies and tagged arts, classical music, concert, elton john, Expo, flute, Gareth Davies, instruments, london symphony orchestra, LSO, musicians, orchestra, peacocks, piano, pokemon, symphony. Bookmark the permalink.